When I signed offlast month, we were about to get started on the main walls and hoping to reach weathertight in time for this issue. Well, we’ve not quite made it… which just goes to show delays can happen on any project. As it turns out, this has been the most challenging phase of the Education House build so far – which is saying something given that we’ve already finished the basement shell. 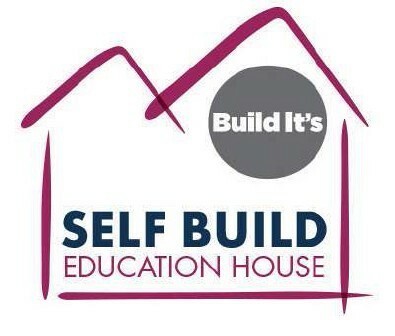 The good news is we’re getting re-schooled on the kind of challenges that can come up on a self build scheme and how to navigate them – so there’s plenty of learning points to share! Those of you who’ve been following our project regularly will know we’ve chosen insulating concrete formwork (ICF) for our main walling system, with a roof of structural insulated panels (SIPs). 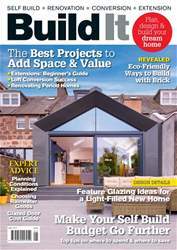 These modern techniques offer a number of advantages that make sense for the Build It Education House – including excellent insulation and airtightness out of the box. What’s more, ICF is easy to waterproof (ideal for basements) and SIPs can deliver great performance in a thin panel profile (great for maximising headroom in a loft space). I described the basics of how ICF works in part four of this series. Fundamentally, you stack polystyrene formwork blocks, brace them, insert any steel reinforcement required by the engineering design, and then pump in the concrete (for a quick guide, see www.self-build.co.uk/icf). At this stage we’ve got openings to form for windows and doors, joists to go in etc – so it’s a bit different to constructing the basement. 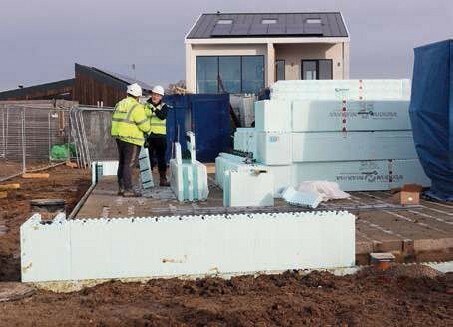 ICF Supplies is providing the Nudura ICF system for the build. Their normal role is to specify and deliver the formwork package for your contractors to erect; but for the Education House they’re also sourcing much of the labour to get the project to wall plate level, ready for the roof to go on. Their in-house training team erected the ground floor formwork and most of the bracing etc, but technical challenges and weather delays meant they ran out of time – so Hadfield Concrete Structures have taken over for the rest of the walling and associated works (such as fitting the posijoists).